Sennior Devanshi Bhavsar is pictured honoring her significant contributor Paula Pauly Thursday evening during Columbian High School’s Excellence in Education dinner. 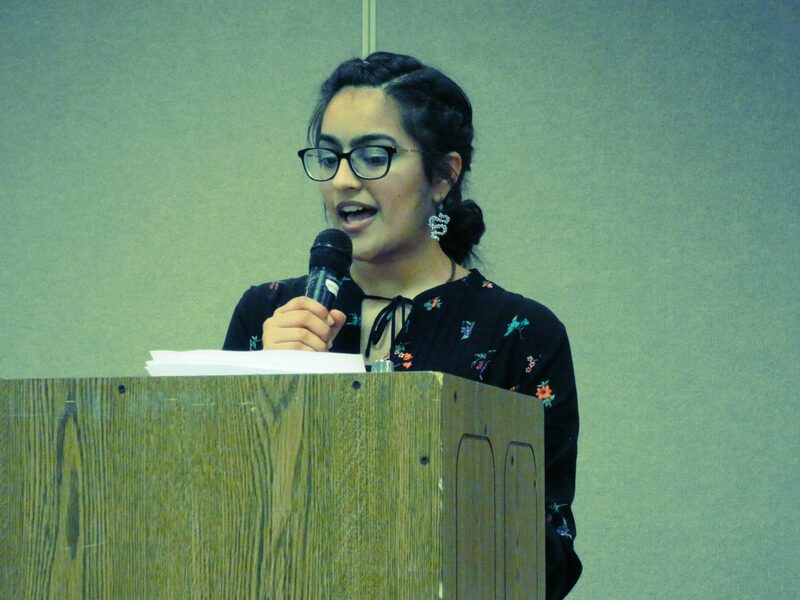 Top students from Columbian High School’s senior class shared their experiences in and out of the classroom by honoring significant contributors Thursday evening. Nine students read essays during Columbian’s Excellence in Education dinner at Camden Falls Reception and Conference Center. Senior Hannah Cooper recognized Bri Shock, her dance instructor. Cooper said Shock never gave up on her or the other dancers and intensified her love for dance. Columbian history teacher Todd Edmond was honored by Eleanor Fanning. Also honoring her dance teacher, Kaia Treadway said it was Laura Stark who motivated her every step of the way and gave her the tools to grow as a dancer. Even though she was afraid of taking Mark Ingalls Spanish II class at Columbian, Patrisha Simpkins said Ingalls grew to be the best teacher she ever had and by far her favorite teacher. “Mrs. Pauly enhanced my love for math,” Bhavsar said. For 14 years Chloe Eppley has been involved with ballet and said she has spent countless hours in ballet class, in costume fittings and in dance recitals, but it was her decision to enter into Katherine Miller’s class that has helped her become a better dancer and a more confident person. “Kathy has been one of my biggest role models,” Eppley said. Carly Schafer said she wouldn’t give up her spot on her softball team because no other team has Dave Hwkins as their coach. “It has been through coach Hawkins guidance that I was able to achieve my dream of college soft ball,” Schafer said. “It is a great feeling to see a teacher so devoted to his students,” Kerrick Fanning said about his AP Biology teacher Chris Monsour. “There is something about AP Bio that makes you want to come to school and sit and learn for 52 minutes,” he said. Jessica Damm honored her girls soccer coach Vince Arnold. Damm said there is no one like Arnold who has poured funds, energy and time into the girls soccer program. “I could not imagine having gone through high school without the support of my team and coach Arnold,” Damm said.